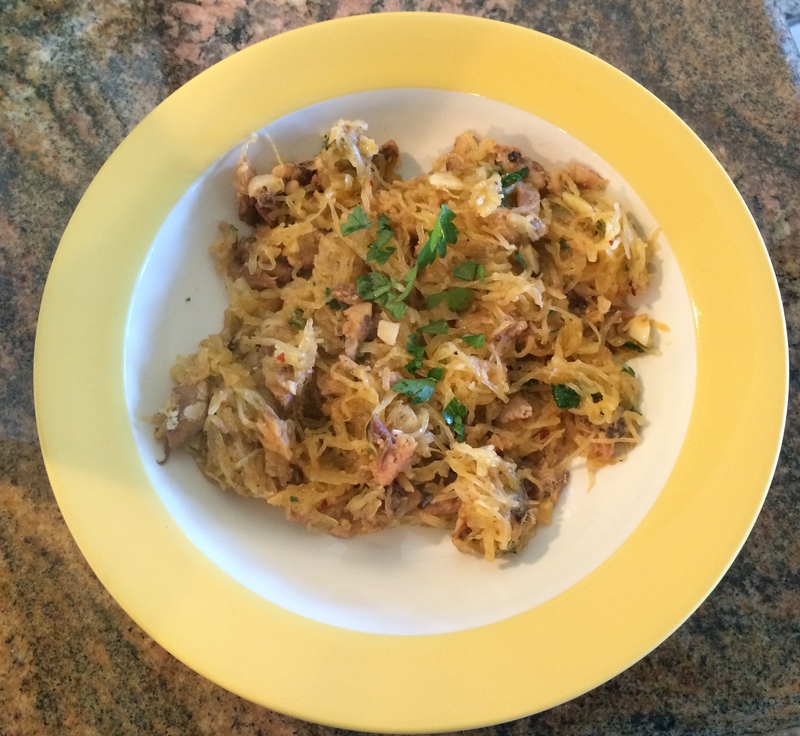 Spaghetti Squash with Sardines – Healthy, EZ, Yummy! The other day I ran across a version of this recipe on theclothesmakethegirl.com, and I thought, yum! What a novel and great idea! 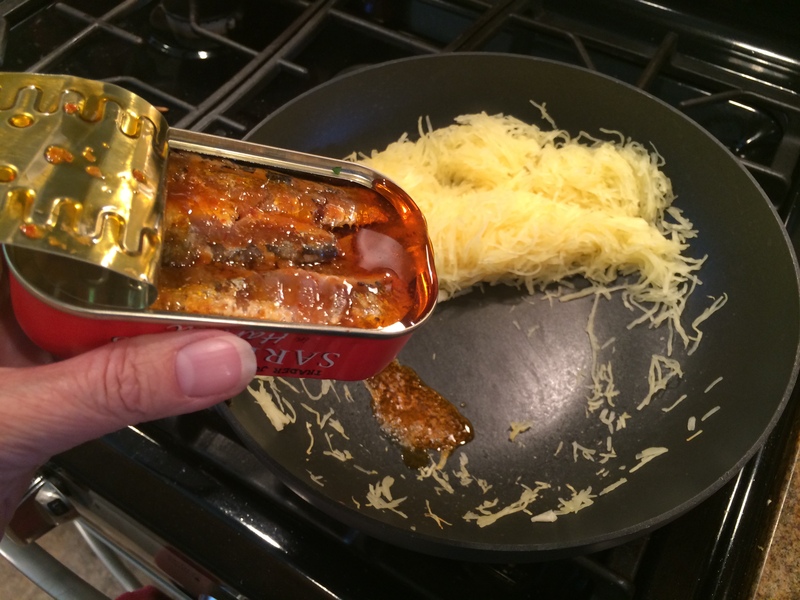 Then I googled the phrase “spaghetti squash and sardines.” Wow. Who knew this was a thing? Must’ve been a gajillion online recipes for this. I am obviously ill-informed. Anyway, I immediately threw together this yummy and healthy dish. * It is so easy to make, full of protein and super low carb. I also perused the internet and learned how to roast spaghetti squash whole, avoiding the giant cleaver/superhuman strength it takes to to cut them raw. Vast improvement! 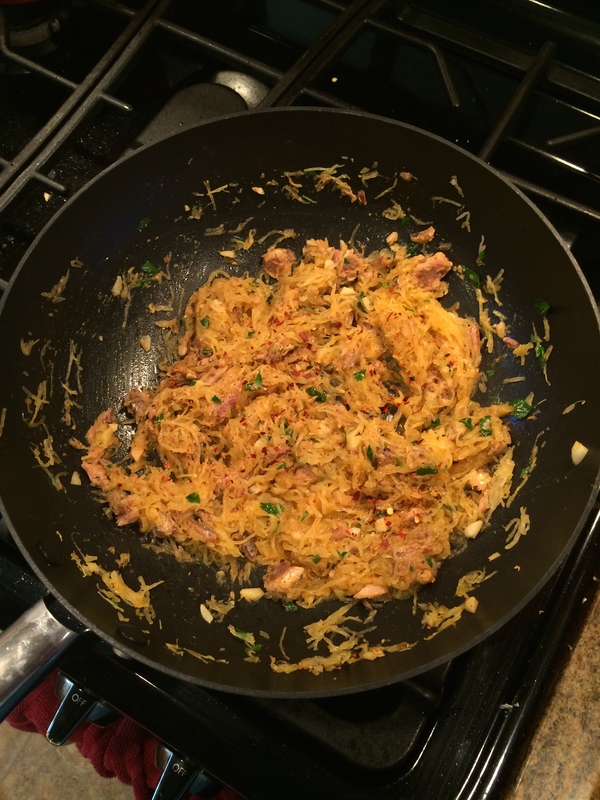 Even if you don’t like sardines with your spaghetti squash, try this method of cooking/cutting them. (NOTE: for those who need to limit their potassium, substitute pasta for the squash and halve the sardines). 1 can (3 to 4 oz) sardines in oil, hot sauce, tomato sauce, or some combination of those; the thing is that there needs to be oil in the can (not just water or just tomato sauce). Heat oven to 400 degrees. Place the whole spaghetti squash on a foil-lined pan and place in the oven for about 45 minutes, or until skin punctures easily with a fork. Remove from oven and allow to cool completely. Cut the squash in half and scoop out the seeds. Using a fork, shred the inside of the squash into spaghetti-like strands. Heat a frying pan on medium high heat until hot. Saute squash in pan for about 2 minutes, until heated through. Move squash to the side of the pan and pour the oil from the from the sardine can into the pan (add according to your taste; I used all the oil from my 4 oz can of sardines in oil with hot sauce). Spoon the chopped garlic into the oil and cook 2-3 minutes or until fragrant and begins to soften. Toss squash into the oil and garlic. Add sardines and parsley, tossing with a couple of wooden spoons and using the spoons to break up the sardines into small pieces. Continue to toss until completely heated through. Remove from heat and add red pepper, salt, and pepper to taste. Sprinkle with fresh basil and serve. Calories: 137; Carbs: 5; Potassium: 363; Sodium: 363. 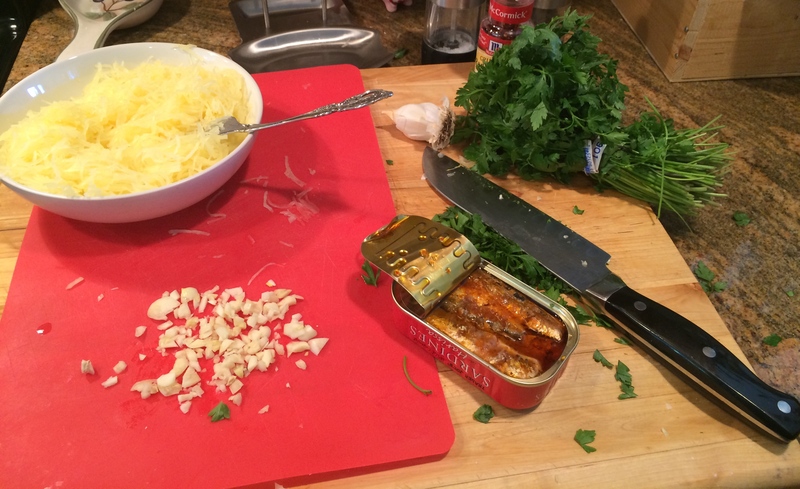 Assumes a 3.75 oz can of sardines in oil and two 1-cup servings of squash.